Her second book ‘The Great Silence,’ is equally dense, if not more so. It takes for its subject three days in the Novembers of 1918, 1919 and 1920 and examines a country consumed by grief. Once again, Britain is in the throes of a profound transition. In between the two books lies the First World War, but Juliet’s interest appears to narrow in on the spaces left between the lines in modern histories – it is not the first charge or the grand surrender, but the tumult of the days before and after that absorb her. “I can’t write about the battles; that’s not what interests me. I want to write about what people are wearing and what people are laughing at, what people are eating and what people are watching,” she says. It is an approach to writing she shares with other members of her family, notably her grandmother. Vita Sackville-West is famous as the author of ‘The Edwardians,’ the one time lover of Virginia Woolf and the gardener responsible for the exquisite beauty of the grounds at Sissinghurst in Kent, England. Vita created the latter with her husband, the diplomat and writer Harold Nicolson. Their extraordinary marriage (both were bi-sexual) and aristocratic lifestyle continue to fascinate modern biographers. Juliet, who was just seven when Vita died, remembers her grandmother as anything but cozy. “She was terrifying,” she admits frankly. Vita habitually wore lace up boots and jodhpurs, topped with silk shirts in jewel tones, complemented by a simple string of pearls. A long cigarette holder held nonchalantly, completed the picture. “She seemed very tall (Vita’s was nearly six feet) especially because I was so short,” says Juliet. Around children, her grandfather was the softer of the two. Both grandparents’ make fleeting appearances in Juliet’s books – their first person accounts of the coronation of George V and the signing of the treaty of Versailles mark them as observers with wit and insight. 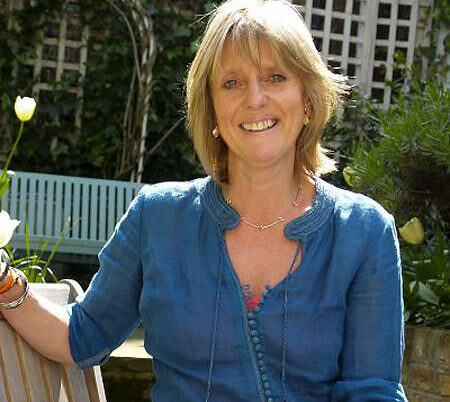 (Juliet will be sharing some of her memories of them at the 2012 Galle Literary Festival.) Describing the humiliation of Germany at the Paris Peace Conference, Harold would tell the writer Marcel Proust every detail, not omitting a single thing, including that they had had tea and macaroons for refreshments. “Both my grandparents liked to do what I like to do, that is to write the detail of it, the colour of it, in fact, the macaroons,” says Juliet. It is no coincidence that both Juliet’s books are set in an England that exists just outside living memory. She says she was drawn to the period because “while there is no one left who would remember the early 1900s it’s not so unrecognizable either.” The elements of contemporary life – from the widespread industrial strikes to the appearance of the first automobiles – were all there, and the human condition itself remains unaltered. “I wondered if I could write the true life of a time,” she says, explaining that she began her research by zeroing in on one very hot summer when temperatures reached 100 degrees Fahrenheit. Since 1915, by government policy, the dead were abandoned in foreign fields, leaving their families no bodies to bury. Those who returned would have a depressing welcome. Disabled veterans would find a dismal system of compensation already in place. The loss of a full right arm warranted sixteen shillings a week, but it was only fourteen shillings if the arm was missing from below the shoulder but above the elbow. A limb amputated below the elbow was only worth eleven shillings and sixpence. The left arm merited a shilling less all round. Shockingly, allowances stopped at anything above the neckline.” Those who had been blinded by gas or left with facial disfigurations received no compensation. As unemployment rates soared, the able bodied fared no better. All the while, a deadly epidemic of Spanish flu, incubated in the trenches now ravaged the globe – an estimated 500 million people were infected. In the light of such a grim aftermath, it’s such an irony that the First World War brought cohesion, says Juliet of the patriotism that initially united an England riven by class struggles. “The most terrible slaughter did bind people together against the enemy across the sea, but when the war came to end, all that dissatisfaction and restlessness and resentment burst open all over again.” She charts society’s restlessness through the plunge in church attendance, the sudden popularity of jazz and the struggle for women’s rights, pausing along the way to comment on the idolisation of Lawrence of Arabia, sexual promiscuity and increased recreational drug use. This year, the world will observe the 100th anniversary of the First World War and Juliet believes the stories in ‘The Great Silence’ have lost none of their potency. Certainly her description of the burial of the Unknown Soldier in Westminster Abbey in 1920, which closes the book, is incredibly moving. Even more so when you consider that many of the women who lost their husbands in World War I would lose their sons in World War II. It is in the build up to the latter that Juliet’s new book is set. Published in The Sunday Times on October 2, 2011, Sri Lanka. Words by Smriti Daniel. Tags: Juliet Nicolson, Osbert Sitwell, Vita Sackville-West, Winston Churchill, World War I, World War II. Bookmark the permalink.